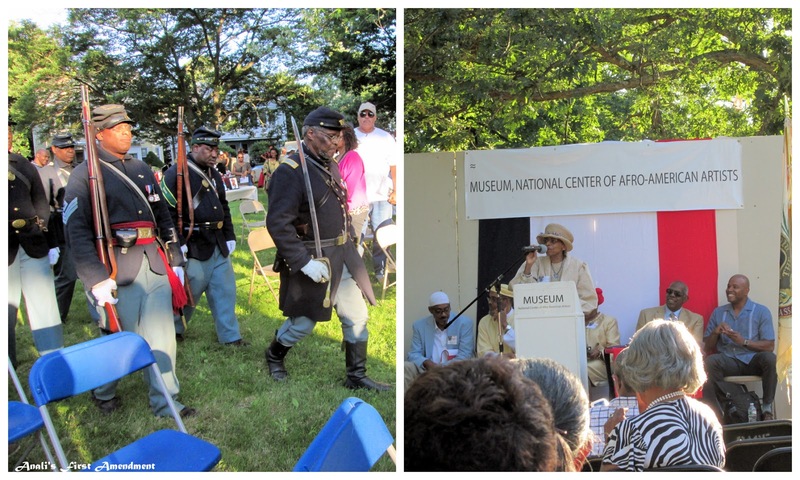 The pictures above are from one of Boston's Juneteenth celebrations. This one was at The National Center of Afro-American Artists in Roxbury yesterday. On the left is the 54th Regiment Massachusetts Volunteer Infantry. On the right, Reverend Andrea Payne is giving the Benediction. I was only able to make it towards the end, but I'd like to go again next year and see the whole thing. I'm happy to see that with each passing year, Juneteenth seems to be gaining momentum. Juneteenth is held each year on June 19th and commemorates the ending of slavery in the United States. June 19, 18665 was the day that the last slaves (in Galveston, Texas) were told that they were free. Juneteenth used to be mostly celebrated in Texas, but now people all over the United States and the world take note of the day. It's so important to remember our national history and local history as well, so it seems fitting to dedicate a roundup with some links that are relevant to Juneteenth and issues of race in America.